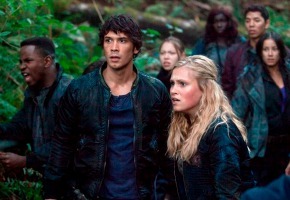 US post-apocalyptic drama series The 100 will begin on FOX8 early next month. Australians Bob Morley (Home and Away, Neighbours) and Eliza Taylor (Neighbours) feature in the series based on the upcoming book series by Kass Morgan. The cast also includes Paige Turco, Thomas McDonell, Eli Goree, Marie Avgeropoulos, Kelly Hu, Christopher Larkin, Devon Bostick, Isaiah Washington and Henry Ian Cusick. It premiered in the US in March and has an Emmy nomination for Visual FX. Ninety-seven years ago, nuclear Armageddon decimated planet Earth, destroying civilisation. The only survivors were the 400 inhabitants of 12 international space stations that were in orbit at the time. Three generations have been born in space, the survivors now number 4,000, and resources are running out on their dying “Ark” – the 12 stations now linked together and repurposed to keep the survivors alive. Draconian measures including capital punishment and population control are the order of the day, as the leaders of the Ark take ruthless steps to ensure their future, including secretly exiling a group of 100 juvenile prisoners to the Earth’s surface to test whether it’s habitable. For the first time in nearly a century, humans have returned to planet Earth. Among the 100 exiles are Clarke, the bright teenage daughter of the Ark’s chief medical officer; Wells, son of the Ark’s Chancellor; the daredevil Finn; and the brother/sister duo Bellamy and Octavia, whose illegal sibling status has always led them to flaunt the rules. Technologically blind to what’s happening on the planet below them, the Ark’s leaders – Clarke’s widowed mother, Abby; the Chancellor, Jaha; and his shadowy second in command, Kane – are faced with difficult decisions about life, death and the continued existence of the human race. Thursday September 4 at 7.30pm. Was this going to be on GO! at some point? Fox8 really should have got onto this sooner. The first season has come and gone already! But I’d highly recommend this show as it just gets better with each episode and I’m so glad it got a second season.